With your support L’eau Est La Vie - No Bayou Bridge pipeline resistance camp has held the frontline 47 consecutive days in the bayous with over 100 strategic direct actions along the 163.5 mile construction route. Couple that with rising waters and the opening of the Bonne Carre spillway, Bayou Bridge Pipeline construction is effectively on hold indefinitely! Energy Transfer’s Bayou Bridge Pipeline, the tail end of the Dakota Access Pipeline, threatened the bayous of Louisiana, our water and way of life. We needed your support and your response has been historice. Thank you for reaching out to help support our collective resistance. We have built the L’eau Est La Vie camp to protect our water and our way of life. Louisiana Rise is a non-profit 501c3 organization. We send warm greetings as we share great news! 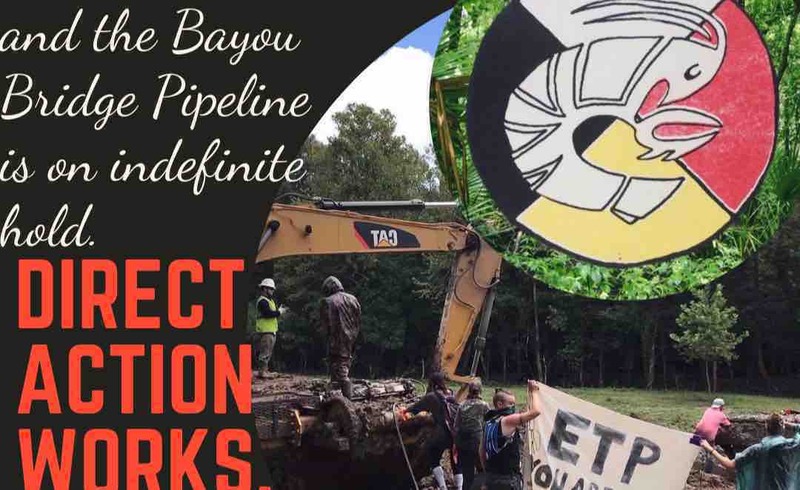 Your support enabled L’eau Est La Vie Camp to successfully wage a strategic direct action campaign that, coupled with rising flood waters and the opening of the Bonne Carre Spillway, have halted the construction of the Bayou Bridge Pipeline indefinitely. 03/04/19 RAYNE, LOUISIANA - Energy Transfer Partners Bayou Bridge Pipeline construction has been delayed indefinitely. The L’eau Est La VIe - No Bayou Bridge Pipeline resistance camp made this announcement today. Their 17-month campaign, that included strategic direct action along the halted 162.5 mile BBP, resulted in nearly 40 days of construction delays. “Direct action gets the goods. For over a year, the L’eau Est La Vie Camp and our global allies have slowed pipeline construction with strategic direct actions and work stoppages. These delays, coupled with the opening of the the Bonne Carre Spillway on Feb. 25th, mean that ETP will be unable to continue construction on the west side of the Atchafalaya Basin, delaying the project indefinitely,” Cherri Foytlin, member of the Indigenous women’s Advisory Council of the L’eau Est La Vie Camp. L’eau Est La Vie Water Protectors held the frontlines peacefully while Energy Transfer Partners used the same dangerous, inhumane security tactics used at Standing Rock. In one incident, land owners requested help from L’eau Est La Vie after it was discovered that the BBP was trespassing and illegally constructing their pipeline through their property without their consent or permission. Over 50 Water Protectors stopped construction in a two-day stand off which resulted in the violent arrests of 4 members of the encampment on private property. In another incident, ETP BBP security pulled Water Protectors from their canoes and journalist from private property, handcuffed them and forced them onto the construction easement, where they waited for St Martins Parish Sheriff’s Deputies to arrive deep in the swamps of the Atchafalaya Basin. While at another encampment on contentious state land, a femme Water Protector who fell from a tree-sit, tazed, handcuffed, forced to lie face-down in the bucket portion of a BBP construction digger until daylight. She was marched across the easement barefoot and charged with felony trespassing. Under Louisiana's 2018 anti-protesting law that defines pipeline construction as “critical infrastructure” with severe penalties, 17 water protectors and journalists are facing felony trespassing charges. ETP initially promised investors the project would be completed the last quarter of 2017. That deadline was moved to the first quarter of 2019, but with millions of gallons of flood water now on top of remaining construction sites, this is simply no longer possible. Citizens in the Atchafalaya Basin have confirmed that ETP has ceased construction. “We began this campaign with four goals: stop the Bayou Bridge Pipeline, protect the Atchafalaya Basin, ensure an evacuation route for the community of St. James and to re-energize the people of the Gulf to fight for their land, communities and well being. Today, we can say we have accomplished all four.” - Statement from the Indigenous Women’s Advisory Council of the L’eau Est La Vie - No Bayou Bridge Camp. The Bayou Bridge Pipeline, the tail end of the Dakota Access Pipeline, is crude oil pipeline under construction from Lake Charles, LA to St. James, LA is projected to cost $750 million. A threat to millions of peoples drinking water, dozens of sensitive ecosystems, while utilizing outdated shipping technology that has failed time and time again, this pipeline was opposed the day it was proposed. ETP is facing issues outside of Louisiana as well. Recently, the Pennsylvania Department of Environmental Protection placed all requests for water and construction permits on indefinite hold, citing ETP’s sloppy construction, numerous ignored spills and disregard of the departments request. Meanwhile, a Sunoco/Energy Transfer Partners natural gas pipeline exploded in Mexico, Missouri this week. L’eau Est La Vie Camp is a hub for pipeline resistance and peaceful opposition to the Bayou Bridge Pipeline. Today is the second day of court hearings to decide whether or not private property can be taken under eminent domain for the private gain of Bayou Bridge pipeline (BBP) and Energy Transfer Partners (ETP). The land in question was clearcut, excavated and construction of the BBP completed even though the company had not obtained a legal easement agreement with the property owners who do not want the BBP on their land. Despite having written permission by the landowners to occupy and defend the land, Water Protectors were brutally arrested by ETP security and assaulted by BBP workers while deputies from the St. Martins Parish Sheriff’s Department stood by and arrested four Water Protectors. To date a total of 17 Water Protectors have been arrested and charged with felonies for attempting to protect the bayous under the state’s new anti-protest bill. As we prepare for winter and what may come, we thank you, all who donated, who cannot be here on the frontlines, we appreciate you. Your generosity will go toward winterizing camp, along with food, wood, fuel, fines, bail, medical bills, medicine and legal fees. We ask you to please share our GoFundMe page and invite others to join you in supporting L’eau Est La Vie Camp. Together we will fight to protect the water and what we love. St. Martin Parish continues to target women from our campaign with False warrants. A Water Protector, our sister, a trans woman of color, was picked up on bogus charges while simply driving down the road in St. Martin parish. This is part of the ongoing harassment of women that we have faced as we continue to stand against the Bayou Bridge Pipeline. We are going to get them out of jail but we need your help. We are still rebuilding after our boats were sunk by ETP security and are low on funds. If you ever wanted to help us, now is the time. Hello from the bayoulands! We’ve had quite a run these past few weeks and first, want to thank you all for your support. Every penny goes a long way! In the pre-dawn hours on Monday morning, Energy Transfer Partners Bayou Bridge pipeline security created life-threatening wakes in the bayou near a construction site and within seconds, sank two of our boats filled with nearly 15 people, including two national media crews. Our femme Captains made split-second decisions, getting us to shore as our boats sank into the alligator and snake filled waters of the Atchafalaya swamp. Thankfully, no lives were lost, no one was hurt, and all are safe. As you can imagine, we sustained incredible losses of valuable equipment used to document construction monitoring, not to mention our boats, and nearly everyone’s personal gear, including cell phones and cameras, boots that were kicked off to survive the current as folks were submerged in the swamp waters, and so much more. We are tallying our material losses, and still shutting down ETP at every turn. Today, we shut down ETP’s special meeting of shareholders in Dallas, TX, and sent Kelcy Warren running from the venue. L’eau Est La Vie joined impacted Water Protectors and land-owners who are on the frontlines of ETP’s Dakota Access, Mariner East, Trans-Pecos River, and Bayou Bridge pipelines to demand accountability for ETP’s actions from shareholders and executives. Inside the meeting, Cherri Foytlin, from L’eau Est La Vie Camp, Waniya Locke, a member of the Standing Rock Sioux Tribe, and Ellen Sue Gerhart, from south-central Pennsylvania disrupted the meeting. Cherri and Waniya were both arrested. Outside the meeting, a multi-story banner was dropped from a parking structure reading “Kelcy Warren Hates Black & Brown People” while Water Protectors rallied with props and banners. Since August 1st, 17 Water Protectors have been charged with felonies under Louisiana’s new anti-protest law that’s currently being hustled by ALEC (the industry backed American Legislative Exchange Council) to several states facing public opposition to pipeline projects. Water Protectors are also facing nearly 100 misdemeanor charges prior to August 1st. L’eau Est La Vie has conducted over 100 non-violent direct actions, stopping construction for nearly 40 days and close to getting a way out for the community of St. James, Louisiana, the terminus for the pipeline and home to Cancer Alley.